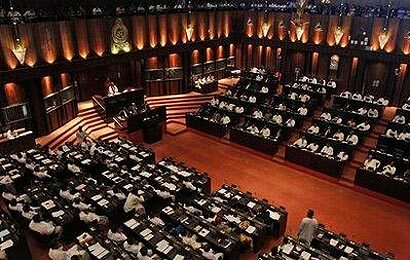 Prime Minister D. M. Jayaratne told Parliament that he had ordered his staff and secretaries not to issue letters, on his behalf, hereafter. A large number of people come to him for official purposes every day and it was impossible for him to issue letters himself to all of them thus he had given powers to his secretaries to write on his behalf, he said. Prime Minister Jayaratne, responding to a series of questions, raised by JVP Parliamentary Group Leader Anura Kumara Dissanayake, who made a special statement in Parliament on Monday and demanded to know, from the government, what action had been taken with regard to a person who had sent a request to the Customs, from the Prime Minister’s office, to release a container load of heroin, imported from Karachi, in the guise of a shipment of grease. Prime Minister Jayaratne said: “On 30.08.2013. some material found in the container, bearing No APHU610322/09, was suspected to be heroin. The total weight of the substances, including the covering material, was 261 kilos and 292 grams. They had been sent to the Government Analyst on 02.09.2013 under the No ENP/2013/12809. The government analyst, on 08.11.2013, issued the analysis report No N/5481/2013 (CD4055/2013). The analysis report identified the substance as heroin and reported that the net weight was 131 kilos and 148.80 grams. “It is reported that a coordinating Secretary of the Secretary to the Ministry of Buddha Sasana had issued a letter dated 23.08.2013 to the Manager, South Asia Gateway Terminals (Pvt.) Ltd, Port of Colombo, PO Box 141, Colombo and police investigations with regard to this are continuing. “As a police investigation is in progress, it is not possible to comment yet on whose instructions the letter had been issued. At the end of investigations, the action taken against the person, who sent the letter, would be informed to the House. “Assistance of the INTERPOL had been sought for the investigation. Further action had been taken to seek the assistance of the Pakistan Anti-Narcotics Task Force through SAARC Drug Offences Monitoring Desk and the SAARC Coordination Group of Drug Law Enforcement Agencies. “Two suspects, Jamal Casif Aziz Abdul of No 323/F/11/3 Islamabad, Pakistan and Mohomed Kamil of T30, Railway Quarters, Maligawatte, Colombo 10, had been taken into custody and remanded after being produced before Maligakanda Magistrate under the B report No 7075/2013. “According to the findings of the investigations done so far, a Pakistani national by the name Sardar Azar Mohomed Khan had been identified as the person responsible for the importation of this consignment of drugs to Sri Lanka and he had left Sri Lanka before that container had been seized. “However, after informing the INTERPOL and Pakistan Anti-Narcotics Task Force about this person, it has now been reported that the suspect had been taken into custody near the Kashmir border in Pakistan. It had also been reported that three officials from the Pakistan Anti-Narcotics Task Force are due to arrive in the country to assist Sri Lanka Anti-Narcotics Bureau officials following a request I made to the latter to expedite the investigations.